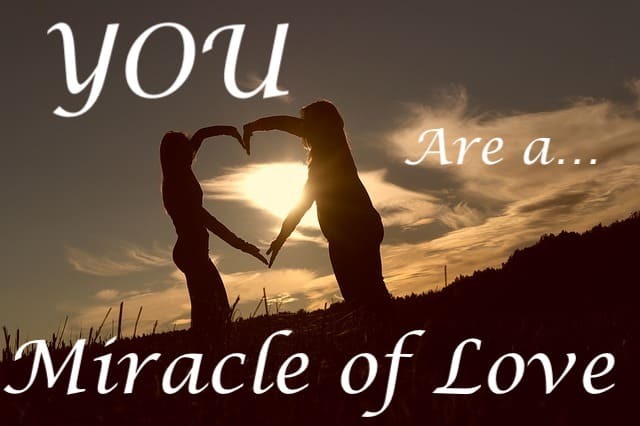 YOU are a Miracle of LOVE! 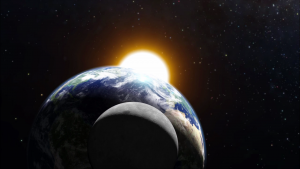 Good MORNING sunshine, good NIGHT moon and stars ~ You were created in pure love just like me! 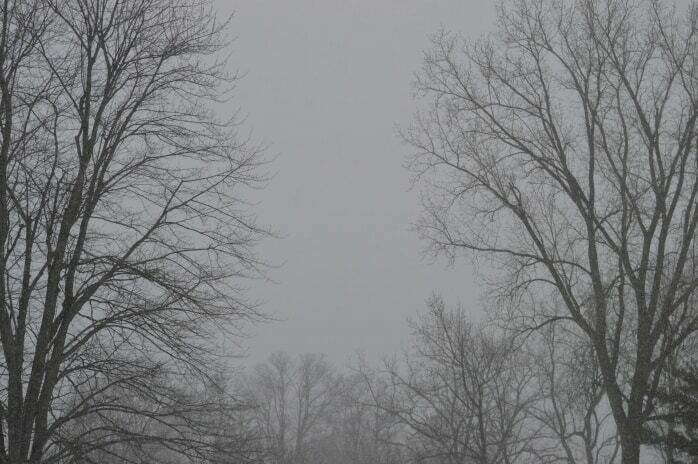 And yet I couldn’t see any of you this morning…just gray skies. But, then I remembered that the sun, moon and stars have an awesome power to draw the love from the universe and beam it down on all of us. I began talking to myself, “ALL of you, (sun, moon and stars) are there without fail every day and every moment in time, I am just shielded from you because of clouds.” Just like the God we cannot see . But we CAN feel His beaming love both from within and from the Universe He created along with every soul in pure love. 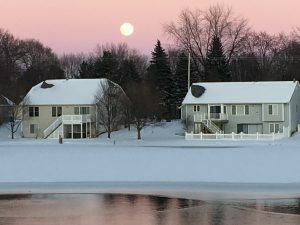 I remembered the totally amazing MOON that showed up right over our lake yesterday in it’s HUGE glory. 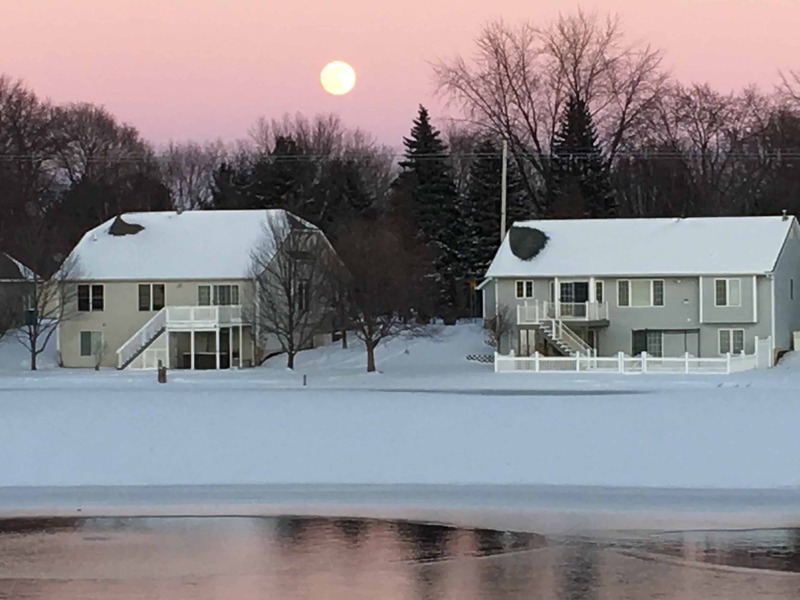 It was a full moon holding a beautiful orange-red gorgeous color, making the sky turn pink. I took a picture, and then just stood looking out and absorbed it’s positive energy flowing inside of me. Nature provides an amazing CONNECTION for us to the awesome LOVE and LIGHT in which we were created. This morning as I began my day, it was much like many other days. I woke up and remembered my intention to write a blog today. I also knew that I wanted any thoughts I share today, to remind you what an amazing and DIVINE creation of God you are! 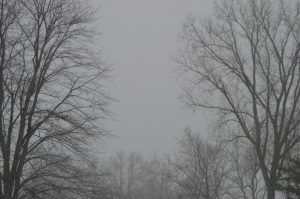 Too often on these sometimes dreary January mornings, we look outside and see the gray skies and feel a bit of energy draining from our bodies. That’s when putting beautiful music into my head by putting on my earphones and finding the “perfect” music to fit my feelings this morning worked beautifully. I was able to shift my energy into a lighter feeling of love for my day. We came into this life on earth to awaken our soul and let it sing to the Universe sending our message of love. CONNECTIONS with people is one of our greatest gifts in this life. I’ve been experiencing the gift of other people so powerfully lately. After my spiritual workout complete with music, deep breathing, stretching, a little QiJong and soft yoga, I sat down to gather some inspiration from the Universe during meditation. For some reason I was drawn to listen to a CD put out by Bruce Lipton called Music For A Shift In Consciousness, which I have had on my phone for years. I often use it when I write, but hardly ever for meditation. The Universe always works in mysterious ways…I wasn’t expecting my meditation to take me TO Bruce Lipton himself, but that’s exactly what happened. The quieting of my mind took me to a memory that I had just read Bruce Lipton’s monthly newsletter yesterday from my email. I was a little put off thinking, “good grief Terry, don’t go to your phone and start reading email.” But, that’s how I was directed. I remembered I wanted to listen to a song he mentioned from a man whose name I recognized from over 3 years ago in Arizona and somehow lost track of his music. I had heard and loved this man’s music! Bruce Lipton was sharing Paul Luftenegger’s new album and his song that he put out now on YouTube with a beautiful video. I knew I had heard the song before, but not complete with video images. It was perfect. I sat there and played his video over three times, it was completely captivating for me. I knew it was his beautiful music and WORDS of love that I wanted to share with all of you today! The song is called Do You Know? His message is exactly what I was saying to the audience I spoke to on Monday this week! 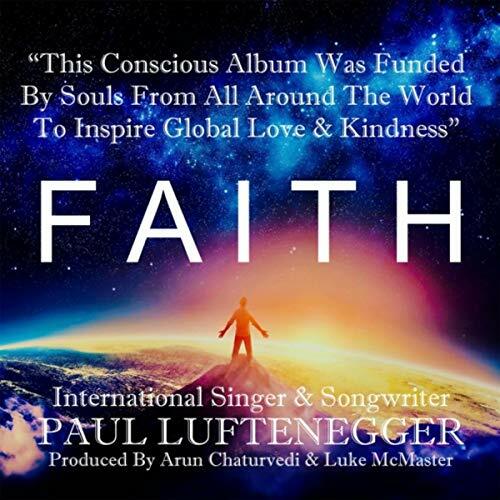 This man, Paul Luftenegger has provided a beauty through his incredible musical talent combined with words that share an incredible message of love for all of us. The video images add the spectacular view into our existence as humans on earth connected in unbelievable beauty to take our soul on it’s journey of remembrance. your soul is with you forever? you are made of love? you have a secret garden inside you? the Universe will always love you? you are a spark of all that is and all that will ever be!? 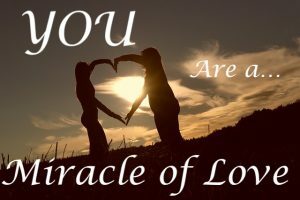 you are part of the great mystery made of love? your heart will always guide you home? There is so much more when you listen as well as visualize through this beautiful video. If you are looking for a totally uplifting experience today, go to his YouTube video and hear and see his incredible message to all of us. He, like all of us, is a channel of love from God. All of your senses will be stimulated. Seeing, hearing, feeling, even taste because you will be tasting the experience of LOVE! And yes, smelling the sweet aroma of life in the tiny baby you once were or one you helped bring into this world. Click here for the experience! 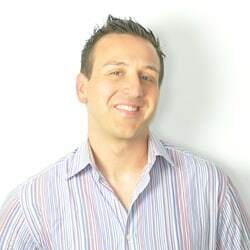 After you have listened you might enjoy going to his website that is www.beekindness.com. Sharing his music, he has a goal is to inspire global oneness. It was interesting as I finished typing this, I looked out my window to find that sparkle of light radiating right in our lake on a gray cloudy day. 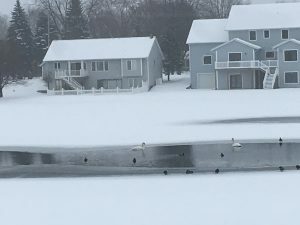 It was the beauty of 2 swans, many ducks and sea gulls frolicking in the water with a very large blue heron standing on the ice watching . We have not had this quantity of bird wildlife in our lake for awhile! A blue heron in winter? I was being reminded how special life is on our planet and in our hearts. In our lake, there is a mixture of pure creation of God connected by humans who put in bubblers to keep the fish alive for the winter allowing water to attract the birds into our view. Human connectedness to animals is with us in our soul. This is another beautiful song with words that just popped into my head at the moment I saw the scene in my lake. A gift…and I began singing it. Years ago I sang those words at my mother’s funeral along with every one of my brothers, sisters, brother’s in law, sister’s in law, children, grandchildren and cousins. For most of my life I thought my soul would be “well” only after I died. When I did die and experienced my soul during my NDE, I KNEW my perfect soul came back with me into my human body. I know now that my soul lives in and around me and it is ALWAYS will. That’s why I go within every day to commune with my soul…it helps my human side become the person I want to be in daily life. Take the chill out of winter…enter the miracle of life when you go within and find your soul full of love and compassion. Your soul will send messages through your heart to your brain to release beautiful life restoring chemicals to your body! We all need that daily reminder that we not our body…but our body is critical because it holds our true essence for this life! Your Soul is pure unconditional love and it lives right within you! *If this video does not connect for you, click on this instead and it will take you to our website where the video will be live on our blog! OR, go into YouTube and type in Do You Know by Paul Luftenegger.